Hello Salty, I go out to eat fairly often but I’m not generally the type to hang around chatting after the meal is over. 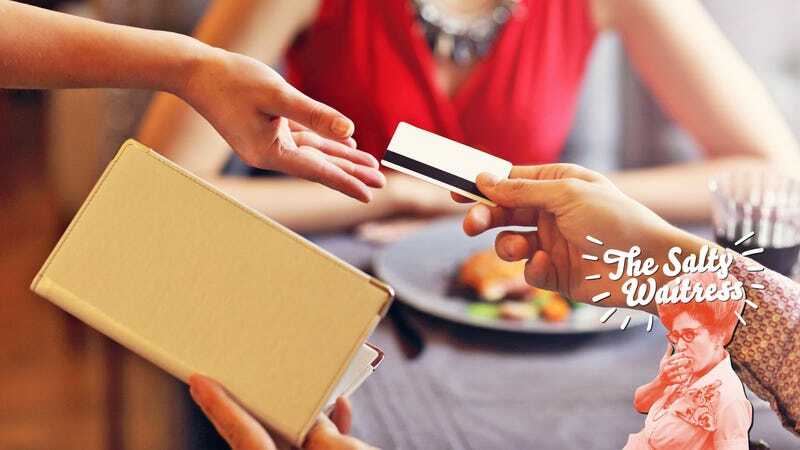 I picked up a habit from my father-in-law of having my credit card ready when I ask for the check so that I can hand it to the server when they come back, forgoing the extra step of the server coming back to collect it. Recently, though, I have gotten a couple of distinct stink-eyes from servers when I hand them the card. Am I doing something that disrupts the operational flow of the restaurant by skipping that step? I figured it was positive for everyone. We get out quicker and they can seat someone else at the table sooner. (FYI, I know that this practice opens me up to potentially overpaying due to a bill error but, given the number of times that has happened in my life, I am totally fine with trading that risk for the convenience). I encountered this fairly often at the last restaurant I worked in. I’ll say up front that there’s nothing wrong with what you’re doing. If you don’t want to review the bill, that’s your business. You know the risks you’re running—an overcharge, or accidentally getting the wrong table’s bill entirely—so I don’t need to lecture you on those. I will say, though, that if you slap down your card without reviewing the bill and then want to protest the charges once you’re signing the final copy, you’re liable to get an eye roll. Here’s where the stink-eye might be coming from, though. In my experience, some people (usually men, just being honest here) throw down their card without looking at the bill as a signal of what big spenders they are. Most do it with a self-satisfied look that says “Oh, I don’t even need to look at the total or how many bottles of vintage Burgundy we ordered—just charge it to my Amex Black card.” Or sometimes I can tell a table is just in a rush and needs to get out the door, itemized bill be damned. This cavalier attitude is no excuse for a server to give anyone a judgmental look, of course. You’d have to behave like a real schlub to earn one of those from me. As for disrupting the flow, that could also explain—but not excuse—the servers’ side-eye. Maybe they were hoping for a 5-minute gap between delivering and picking up the bill, which they wanted to use to check on another table or take a dessert order. In their minds, you threw off their groove, man. But again, that’s not an excuse for servers to give you a weird look, or, to let their frustration show. In the business of waiting tables, a night at work is always full of surprises and complications and changes in plans. You can’t let them see you sweat. One final thought for you, speedy eater: If you really want to get out of your meal ASAP, try carrying cash. That way, you can look at the bill, review it quickly, leave the money (tip included), and jet. No need to wait on that server to bring your card back, and you can double-check that all the charges look right.